Flash! Friday is 1 years old, congrats! Which means it’s competition time for all, all week! I thought I’d take part AGAIN! We had to write a piece from the image given, and it had to be no more or fewer then 350 words. Pretty tough… But below is what I wrote. It’s an ambiguous piece with lots of imagination, leaving it up to you (the reader) to decide what’s real and what isn’t. 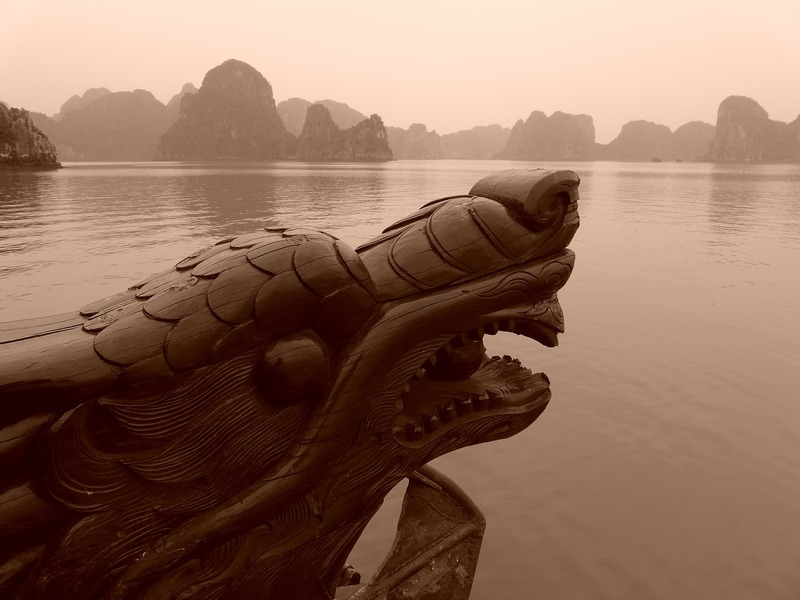 Dragon of Halong Bay (Vietnam). Photo by LoggaWiggler. I lean over-board, seeing my reflection down in the ripples the dragon creates. I look ahead to see a hexagon piece of blue sky, and the sun beginning to be smothered by the clouds. The irregular sizes of land around us scattered unevenly, as we bobble in the centre of the lake. I stand behind the dragon feeling its layered, semi-circular scales on the top of its head under my flat palm. “It isn’t real you know?” I hear Dad say behind me, containing his laughter within his chest and throat. I continue to stroke him, looking at the land nearest to us on my left. I watch a teenage boy and girl holding each other, gazing into each other’s eyes. She wears a white and blue hatchet dress; he wears his knight’s uniform. He steps away from her on the high land, her eyes widen. Her light pink lips open as she takes a step back. He kneels down, his mouth moves like a prayer. She smiles, runs up to him and he lifts her up as they kiss. The dragon continues to glide along the water, moving closer to the clusters of land. I see the tops in destruction. The edges crumbling, the grass burnt, people fighting with swords and bows and arrows. A king is hiding behind his knights, until they are tossed aside, some in the water and others hit the rocks. The king begs I hear his screams echo towards me, until an arrow pierces through him, hitting the dragons left side of his neck. I see a body in the water, a young knight and a blue and white hatchet dress floating on the water. I blink, the arrow disappears. I look across the water to the knight to see tangled seaweed floating over the ripples. I look away from it and instead look ahead at the route the dragon will take. I stroke the dragon’s head and move my hand down to the left of it, feeling the hole of the arrow. I look behind to dad, he’s gone. So, what did you think? Feel free to let me know. Check out Flash! Friday’s site and have a go yourself.